Rain was falling, a light wind blew. We walked along the A4 from Chequers crossroads towards Chippenham, noting the two streams flowing down from north of the A4, moving fast on account of the recent rain. The first one, with its neat cut-back banks coming through Mynte Farm, the second, from Biddestone Manor, following the line of pylons. The area around the works was fenced off with large metal barriers. However, damage to the landscape was limited to the building area and hawthorn, showing the first tips of blossom on its dark branches, and undergrowth of grasses, sedges, nettles and docks flourished all around. We edged along the barriers; once round the corner and off the A4 we could see more of the work that was being carried out. Smaller barriers were positioned on the dark gravelly substrate, leaning up into the bushes on the other side of a pool of brown water. Looking down we saw a large black pipe next to a trickle of water and further along, parallel to this small stream, a larger one – the Pudding Brook. It seemed likely that the small stream was the one running between the A4 and the Pudding Brook but its source in the field had dried up and possibly it began in the group of hawthorn trees near the roundabout. Machinery and other apparatus had been left ready to be used again on Monday morning. There was a yellow digger, a small white machine on two wheels with a long metal pole wrapped in cables – a power source for lighting – and a bright blue cylinder. Square metal tubes lay on the ground. All of this, we discovered, was on a platform underpinned by a mesh of rods which extended up to the lower layer of the road; this part was covered in dark grey gravel, extending at the sides to give the extra space needed for the dual carriageway and lined with red and white traffic cones. We walked along this stripped back section, then down the clay bank of the unfinished verge, dark with rain, a thin flexible pipe the same bright blue as the cylinder seen earlier lying in the lowest part. Sapling trees had been planted next to a new fence; we climbed over into the field then walked back to the brook which was spanned awkwardly by metal mesh barriers slanting down and then up the bank. The bridge was exposed in section and there were lines of sturdy metal beams, with rusted plates on top, then more metal supports beneath the surface. Below, the Pudding Brook slowed its pace until like a pool it flowed past white plastic sand bags slumped on the gravel and under the reinforcements of the bridge. The white hawthorn blossom shone in the fading light; we could just see primroses on the ground as we followed the Pudding Brook upstream along the edge of the field. The banks were high, six feet in some places and on the other side the lambs and sheep called for each other. Electricity pylons ticked overhead. We went through a gap in the hedge and crossed two more fields, still following the brook. A buzzard flapped across the sky. We left the fields for the track, originally the old London Road. By the time we got there it was dark and owls were in the woods. The A4 was lit up with car headlights and tail lights and the bright interior strip lights of occasional buses. The field where, on the map, the small stream rises. The line of trees marks the course of the Pudding Brook. A large ditch near the roadworks. Barriers next to the roadworks with the small stream emerging from beneath the hawthorn bushes. The new fence, with saplings planted against it, next to the widened road. The unfinished road, south of the A4. The reinforced bridge over the A350 with the Pudding Brook flowing beneath. 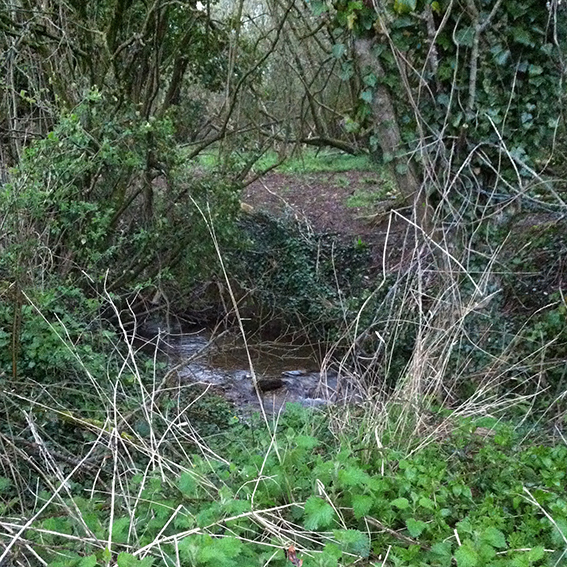 The Pudding Brook between a field and a small patch of land near the roadworks.